Continuing on from Part 2 of the series, "Can I Install Tern Handlepost/Fork on Dahon Frame? ", this is the third part of the series. In this post, I will be checking for the compatibility of the new Tern handlepost and fork with the Dahon Boardwalk frame. In Part 2, I compared the Tern and Dahon/Fnhon handleposts side by side, and the differences have already been highlighted. The same comparison was also done for the Dahon fork and new Tern fork. 1) Tern fork has a longer steerer tube than the Dahon fork, as the Tern handlepost requires a longer steerer tube to clamp onto. 2) Tern fork uses a starnut for pre-loading the headset bearings, different from the threaded compression bolt used on the Dahon fork. 3) Tern handlepost has an integrated headset Upper Cover shape at the bottom of the handlepost, which eliminates the need for the headset Upper Cover. 1) Is the Tern fork steerer tube long enough for the Tern handlepost, or is it too short? 2) With a starnut system, is the installation method different or still the same? 3) How will the whole headset and handlepost assembly look like without the use of the headset Upper Cover? Will the base of the Tern handlepost be compatible with my current headset and Dahon Boardwalk frame? I started by studying the assembly of the headset and the Upper Cover. This was done using a spare LitePro headset that I had. From left to right: Upper Cover, compression ring, headset bearing inside the bearing cup. The lower headset assembly is not shown. If assembled without the Upper Cover, the headset assembly would look like the stack on the right. When the Upper Cover is placed on the compression ring, it provides a flat platform for the base of the handlepost to rest on. There would be a small gap between the bottom edge of the Upper Cover and the bearing cup to allow for movement during steering. If the Tern handlepost is to be installed, the Upper Cover will no longer be needed. This is because the base of the Tern handlepost will also fulfill the role of the Upper Cap, which is to press onto the compression ring. In other words, the Tern handlepost will rest directly on the headset compression ring. Comparing the bottom profile of the headset Upper Cover with the base of the Tern handlepost. They look quite similar! When the base of the handlepost is placed on the compression ring, there should be a small gap between the handlepost and the bearing cup. There is a very small gap here, not sure if it is sufficient for smooth rotation. It seems that the Tern handlepost can be installed onto the LitePro headset, although it can only be confirmed upon actual installation. Note that I had to remove the rubber seal at the bottom of the handlepost as it was rubbing against the headset bearing cup. Next, I checked the height of the headtube for the Dahon frames, as the headtube height directly affects the length of the steerer tube that protrudes above the headset. If the headtube is tall, there would be less steerer tube sticking out from the top of the headset. Dahon Boardwalk frame with a headtube height of 89mm. Dahon Vitesse frame with a headtube height of 89mm. Similar frame design as the Boardwalk and Speed frames. Dahon MuEX frame with a headtube length of 101mm. This is 12mm taller than the Boardwalk/Speed/Vitesse frames. After measurement, I found that the Mu frame has a taller headtube than the Boardwalk/Speed/Vitesse frames. This extra height is 12mm, which corresponds to the different steerer tube lengths. As stated earlier, the Mu fork has a steerer tube that is 123mm long, while the Boardwalk/Speed/Vitesse fork has a steerer tube length of 111mm. This difference in steerer tube length is solely due to the difference in headtube height. Other than the headtube height, the clamping height of the handlepost base is also important. This is directly related to the length that the handlepost wraps around the steerer tube. By logic, a taller clamping length should give a stiffer and stronger interface between the fork and handlepost. Dahon/Fnhon handleposts have a base thickness of around 26mm. This is not exact as the base is sloped. However, upon actual measurement, the clamping height of the Dahon/Fnhon handlepost is only 12mm. The Tern Physis handlepost has a base thickness of 53mm, twice as much as the Dahon/Fnhon handlepost. This means that the clamping height of the Tern handlepost is likely to be twice as much as a Dahon/Fnhon handlepost. As you can see from the base thickness, the Tern Physis handlepost has a much thicker base, which requires a longer steerer tube to clamp onto. This is one of the factors that will give greater stiffness over the Dahon/Fnhon handlepost and fork design. Next step is to find out the length of the headtube that is normally required to install the Tern handlepost and Tern fork. This is done by inserting the handlepost onto the fork, and aligning them such that the handlepost base is at the optimal clamping height. When the Tern handlepost is at the optimal clamping height on the steerer tube, the headtube length required is 101mm. This is 12mm too long, as the Dahon Boardwalk headtube length is only 89mm. This is how it should look like if the headtube length is 101mm long. The end of the steerer tube should rest just below the circular surface for the top cap. From this, we can conclude that the steerer tube for the Tern fork is too long for my Dahon Boardwalk headtube. Before we go any further, let us just try out the Tern fork and Tern handlepost in the Dahon Boardwalk frame. Tern fork in the Dahon Boardwalk frame, without the headset Upper Cap. The Upper Cap is not installed as the Tern handlepost does not need the Upper Cap. The exposed steerer tube length is far too long at 49mm! I will need to cut away the steerer tube to shorten it for this frame. With the Tern handlepost installed onto the Tern fork. As you can see, the steerer tube is too long as it protrudes quite a bit above the base of the handlepost. The extra length of the steerer tube is measured to be about 9mm. To be safe, I will cut away about 12mm of the steerer tube, so that the steerer tube is just below the top edge of the handlepost base. By now, it is quite clear that the Tern fork steerer tube is too long for my Dahon Boardwalk frame. It will be necessary to cut short the steerer tube to ensure that it is compatible with the Tern handlepost. From the calculations and measurements shown above, cutting away 12mm seems to be about the right amount. As a side note, you may have noticed that from the measurements above, the ideal headtube height to suit the Tern fork and Tern handlepost is 101mm. This is exactly the headtube height on the Dahon MuEX frame! In other words, if I wanted to install a Tern fork and Tern handlepost on a Dahon Mu frame, it would go on perfectly without needing to cut the steerer tube! 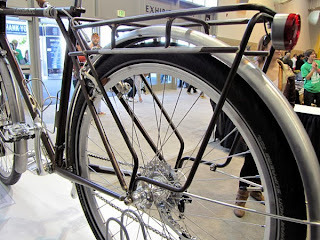 This is something worth considering for those who has a Dahon Mu frame, and want to install a Tern handlepost. Now that all the considerations and measurements have been done, the next step would be to do the actual modifications required. The main task would be to cut the steerer tube, but it is not so straightforward as the starnut is still in the way. In the next part of this series, I will show how I did the modifications and installation of the Tern handlepost and Tern fork onto the Dahon Boardwalk. Part 4 is now up! Click here to continue reading. 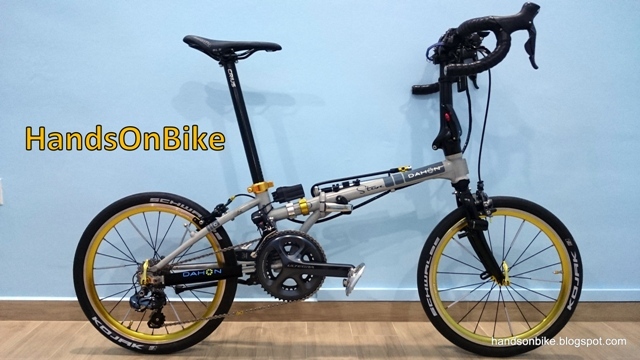 Do you think such upgrad (Tern fork + 3D hinge) is possible on a Dahon Jetstream P8, whos headtube is 120mm ? The Jetstream P8 has a suspension front fork. Changing it to a non suspension fork will lower the front of the bike by quite a lot, and the whole geometry of the bike will be wrong and quite unrideable. So even if it is possible, it should not be done. I also have a Jetstream e-bike converted, (BBSHD) and I need a better front suspension. I need help installing a Spinner GRIND 24" on it. Do you know if it's possible? Thanks for these insights. I'm very keen to change my Dahon Vector handlepost and fork to the Tern. It's great to see that a direct swap is possible with the MuEx frame @ 101mm headtube height. Where can we see the headtube height of the Dahon Vector frames please? Well you can just measure it, as shown above. What an excellent description of your project you have here! I want to do the same to my MU P8 and according to you I can do the conversion to Tern fork/Physis without any cutting or other modifications. There are several different fork types from Tern out there. Do you know if all will fit the MU frame? I actually want to use one of steel(HiTen?) since I want some extra weight upfront due to the high power MAC motor in my rear wheel. Not sure if the other forks will fit, as the steerer tube length might be different. To be safe, go with the one that i used. Cheers, Steve! I didn't quite get the exact type you used from your writings (but I may have missed something)?Do you have a part number I can use sourcing for my fork? I've got a lot of good tips from your other articles as well. Great work and really helpful! I don't have the part number as it was the only fork available at that time. You can check with them to get the steerer tube length to find the one that you need. The steerer tube will be too short, as the Tern handlepost requires a longer clamping section. You will need to get the Tern fork and handlepost to fit the Mu frame. Hi if my exposed steerer tube length is 28mm instead of your modified 36mm do you think it is enough for Tern 3D handlepost? Hi, if my exposed steerer tube length is 28mm instead of your 36mm do you think the Tern 3D handlepost will fit?